I was born and raised in Tavan, a Black Hmong and Dai village three hours’ walk from Sapa. I’m the fourth of six children – I have two brothers and three sisters.I began selling local handicrafts in my village when I was eight years old. In the beginning, the only words of English I knew were, ‘Buy from me’. I didn’t understand what foreigners said to me, but learned quickly, and soon began selling handicrafts also in Sapa. When I was ten, a group asked me to take them from Sapa to my village, and they stayed one night in my home. When we came back to Sapa, they told the manager at their hotel that I spoke excellent English and should work as a trekking guide for the hotel. I chose to stay in school, but worked as a guide on weekends and holidays to help my family. 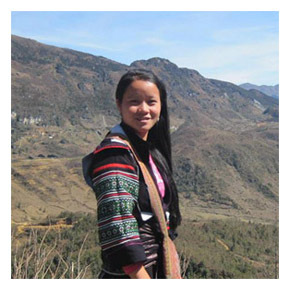 When I finished secondary school in 2007 I became a full-time trekking guide, working for several different hotels, Sapa Sisters trekking company, and independently. In 2014, at the age of twenty, I married my partner Sung, a young Flower Hmong man from a neighbouring province. We are expecting our first child in January 2015. I’m here to make sure your trekking experience is one you never forget – you’ll come as a stranger, and leave as a friend.